Walter Macon Lowrie was born on February 18, 1819, and came to saving faith in Christ while in college, in 1834. Like Lyman Atwater of yesterday’s post, Walter soon determined to enter the ministry. He attended Princeton Seminary in preparation, and during those years resolved to become a missionary. The continent of Africa was particularly upon his heart, but following his ordination, the Board of Foreign Missions determined the need was greatest in China. Lowrie set sail in January of 1842. By August of 1847, he was dead, murdered by pirates. God is sovereign, and even when death seems senseless. it is only because we lack the Lord’s wisdom and knowledge. Especially in such cases is it wrong to try to attach a reason; we can only trust in God’s goodness. Yesterday was our communion here; and though it was so near to the end of the session, that we could not have much time for preparation, and no fast day was appointed, yet it was about as profitable a day as I ever spent. True, at the table, and whilst partaking of the elements, I was not happy; nay, before I rose from the table, I was almost as miserable as I ever was. Yet it was profitable. A temptation came across my mind to this effect: “I am not now enjoying communion with Jesus Christ; and therefore I am not a Christian. I may as well now give up all pretensions to religion, and quit acting the hypocrite any longer.” And although not willingly, I felt as if I ought to do so; but the thought rushed into my mind, “If I am so miserable under the hidings of God’s face only, how shall I bear His eternal wrath?” It was the first time I had ever been influenced more by fear than by other motives. I was miserable, however. But see the goodness of God and of Jesus Christ. After church, I was thinking of my conduct during the session, and meditating on the two verses, “Seek ye first the kingdom of God;” and all my anxious cares vanished. I had been impressed deeply with a sense of my sinfulness, and was wishing to make some resolutions; hereafter to live more to the glory of God, but felt almost afraid to do it. I knew I should fall away; and I felt that it would but aggravate my guilt, were I to sin against such renewed obligation. But the sentence, “Sufficient unto the day is the evil thereof,” calmed my heart. I felt that it was my duty to follow present duty, and leave the future to God, without any anxious cares; and I was enabled to do so, and roll all my cares upon the Lord. Oh, the peace I at that moment possessed! I could scarce refrain from laughing, I was so joyful. I determined then to live every day as if it were to be the last I should have to live, and to do my duty accordingly;—in reality, “to live by the day.” At secret prayer I was more full of God’s presence, and comprehended more of that view of Christ’s character, which is so great, grand, and incomprehensible, that I could scarcely proceed for joy, and from my own experience during the day, I could tell something of the difference between God’s presence and his absence. Today, I cannot say I feel, or have felt, as I could wish—not so much life and animation; but I have been enabled to mourn for it. During the sermon (Mark xvi. 15), I was enabled to see more of the greatness of the Christian religion than I ever did before, and to feel, too, that man could not be the author of such grand ideas as I saw there held out. I wish I could give you some idea of the emphasis she used, but pen and ink cannot express her manner and the feeling she manifested. She very cordially asked me to call in and see her; “for it is food to me when any of God’s children come to see me; it is food.” She went on thus for some time, talking about various matters, but all of them religious. Oh! how little I felt when I heard her talk thus, and compared my attainments in the Christian course with hers. Give yourselves wholly to the Lord, in all you say and do. See the Lord as your only gain in this life. See Him as your All in all. You will not regret it. You will not suffer true loss, but will only gain true eternal riches. Memoirs of the Rev. Walter M. Lowrie, Missionary to China. by Rev. William Smith, of Glasgow (1836). Q.7. What are the decrees of God? Eternal purpose.—A design or intention, existing in the Divine Mind from eternity, or before the commencement of time. Foreordaine whatsoever comes to pass.—Appointed to accomplish, or to bring about whatever is good, and to permit what is evil. That there are decrees of God.—Psal. ii. 7. I will declare the decree. That these decrees and God’s eternal purpose are the same.—Eph iii. 11. According to the eternal purpose which he purposed in Christ Jesus our Lord. That the decrees of God are according to counsel or advice.— Ps. xxxiii. 11. The counsel of the Lord standeth for ever. That the counsel or advice which God follows is that of his own will.— Eph. i. 5. Having predestined us—according to the good pleasure of his own will. That God, by his decrees, hath foreordained whatsoever came to pass, or whatever happens in the world.—Eph. i. 11. Who worketh all things after the counsel of his own will. That God has done all this for his own glory.—Prov. xvi. 4. The Lord hath made all things for himself. 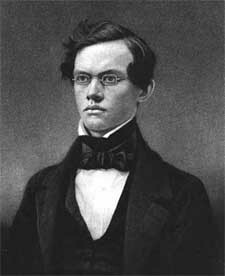 Benjamin Breckinridge Warfield graduated from Princeton Seminary in May 1876. The previous summer he had supplied the Presbyterian church in Concord, Kentucky, and after graduation served for several months as stated supply at the First Presbyterian Church of Dayton, Ohio. He was assistant pastor at the First Presbyterian Church of Baltimore from November 1877 to March 1878. Eagerly sought by Western Theological Seminary, he accepted the invitation to teach New Testament. After nine years at Western, he came to Princeton. ADDENDUM—FURTHER STUDY: How and When did Warfield Die? Jerry and Bernardus Vos reported to friends and relatives that Warfield collapsed from a heart attack in the Vos’s front yard at 52 Mercer Street on his way home from class on February 16, 1921. Warfield died that evening at his home. See New York Times, February 18, 1921, p. 11, for a brief obituary notice. Zaspel writes, “On December 24, 1920, Warfield was walking along the sidewalk to the Vos home, just a few hundred yards across campus from his own home, when suddenly he grasped his chest and collapsed.” Both Dennison and Zaspel agree, however, with Machen’s words to his mother. Machen wrote that when they carried Warfield out at his funeral, Old Princeton went with him. And on receiving his question, I then searched and found the following comparisons. Hopefully this will, cumulatively, provide some addition insights. In summary, I would have to conclude that Dr. Warfield suffered a first heart attack on Dec. 24th, and that this was the one that Johannes Vos remembered. Sproul erroneously understood that to have been the fatal heart attack. Whether Johannes Vos implied or stated as much is another question. But it was the later heart attack, on the evening of February 16th, that took Warfield’s life. Jerry and Bernardus Vos reported to friends and relatives that Warfield collapsed from a heart attack in the Vos’s front yard at 52 Mercer Street on his way home from class on February 16, Warfield died that evening at his home. See New York Times, February 18, 1921, p. 11 for a brief obituary notice. Zaspel writes, “On December 24, 1920, Warfield was walking along the sidewalk to the Vos home, just a few hundred yards across campus from his own home, when suddenly he grasped his chest and collapsed.”  Both Dennison and Zaspel agree, however, with Machen’s words to his mother. Machen wrote that when they carried Warfield out at his funeral, Old Princeton went with him. James T. Dennison, Jr., “The Life of Geerhardus Vos,” in Letters of Geerhardus Vos, ed. James T. Dennison, Jr. (Phillipsburg, NJ: P&R, 2005), 49. Dennison, James T., “The Life of Geerhardus Vos,” in Letters of Geerhardus Vos, ed. James T. Dennison, Jr. (Phillipsburg, NJ: P&R, 2005), 49. Cf. also Calhoun, Princeton Seminary, 2:210. Calhoun’s volume contains a photograph of the seminary campus with a key labeling the Vos home and others (plates between pp. 298 and 299 of volume 2). “[Dr. Warfield] and my father both like to take walks along the stretch of Mercer Street in fron of the Seminary campus” (Bernardus Vos to Roger Nicole, July 3, 1967). Jerry and Bernardus Vos reported to friends and relatives that Warfield collapsed from a heart attack in the Vos’s front yard at 52 Mercer Street on his way home from class on February 16, 1921. Warfield died that evening at his home. See New York Times, February 18, 1921, p. 11, for a brief obituary notice. J. Gresham Machen wrote his mother an account of Warfield’s last day; see Stonehouse, J. Gresham Machen, 309-10. Stonehouse, Ned B., J. Gresham Machen: A Biographical Memoir. Grand Rapids: Eerdmans, 1954, p. 309-310. I am writing to tell you of the great loss which we have just sustained in the death of Dr. Warfield. Princeton will seem to be a very insipid place without him. He was a really great man. There is no one living in the Church capable of occupying one quarter of his place. To me, he was an incalculable help and support in a hundred different ways. This is a sorrowful day for us all. Dr. Warfield had been in poor health since Christmas, having suffered from shortness of breath ever since his attack. But yesterday he took one of his classes for the first time since his illness. He seemed to suffer no ill effects. But at eleven o’clock at night—after about twenty minutes of acute distress—he died. This personal report came from the elderly Johannes Vos, son of Geerhardus Vos, in private conversation with R.C. Sproul, as Sproul reports in Tabletalk, April 2005, 4. Sproul has some details wrong, however, when he reports this event as occurring in 1921 and as the event that took Warfield in death. The heart attack Vos describes would have been December 24, 1920. Stonehouse, Ned B., J. Gresham Machen: A Biographical Memoir, 309. R.C. Sproul, Tabletalk (April 2005): 4. Twenty-five years ago I gave an address at a college in western Pennsylvania. After the service was completed, an elderly gentleman and his wife approached me and introduced themselves as Mr. and Mrs. Johannes Vos. I was surprised to learn that Dr. Vos was the son of the celebrated biblical theologian Geerhardus Vos, who had written a classical work on redemptive history entitled Biblical Theology, which is still widely read in seminaries. During the course of my conversation with them, Dr. Vos related to me an experience he had as a young boy living in Princeton, New Jersey, where his father was teaching on the faculty of Princeton Theological Seminary. This was in the decade of the 1920’s, a time in which Princeton Theological Seminary was still in its heyday; it was the time we now refer to as “Old Princeton.” Dr. Vos told me of an experience he had in the cold winter of 1921. He saw a man walking down the sidewalk, bundled in a heavy overcoat, wearing a fedora on his head, and around his neck was a heavy scarf. Suddenly, to this young boy’s horror and amazement, as the man walked past his home, he stopped, grasped his chest, slumped, and fell to the sidewalk. Young Johannes Vos stared at this man for a moment, then ran to call to his mother. He watched as the ambulance came and carried the man away. The man who had fallen had suffered a major heart attack, which indeed proved to be fatal. His name was Benjamin Breckinridge Warfield. I was thunderstruck by this narrative that was told to me by the now elderly Johannes Vos. I felt like I was somehow linked to history by being able to hear a firsthand account through somebody telling me of the last moments of the legendary B.B. Warfield’s life. At the time of his death, Warfield had been on the faculty of Princeton and had distinguished himself as its most brilliant theologian during his tenure. New York Times, February 18, 1921, page 11. Professor of Theology at Princeton Had Published Many Books. PRINCETON. N. J; Feb. 17.— Dr. Benjamin Breckenridge Warfield, professor of theology at the Princeton Theological Seminary, died suddenly at his home last night. Among the Papers of William A. McIlwaine there is a letter preserved in which his father, William B. McIlwaine, wrote to J. Gresham Machen, lamenting the spiritual decline of the Southern Presbyterian Church. Perhaps I will post a transcription of that letter here soon. But I mention that letter by way of introducing the following two reports issued by Dr. William Childs Robinson and published in volume 5 of CHRISTIANITY TODAY, reports which mirror McIlwaine’s letter of concern. Robinson was one of the shining academic lights in the Southern Church and a committed evangelical, Reformed Christian. His first article for CHRISTIANITY TODAY appeared in the July 1930 issue and he also served as a correspondent for the magazine, writing reports on conditions and events within the Presbyterian Church, U.S. [aka, Southern Presbyterian Church]. 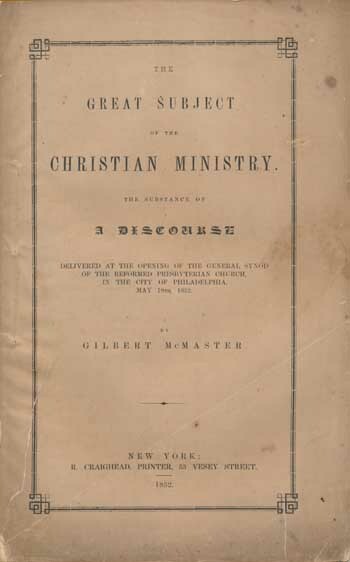 Following are two of his reports, reflecting on then current events in the Southern Presbyterian Church, while in the second report he turns his attention to the Northern Presbyterians, the IBPFM trials and the Church’s continual struggle against spiritual decline. As William Iverson is fond of saying, “God has no grand-children.” — which is to say, the urgent work of evangelism must be done afresh in every generation. Shall We Keep the Faith? According to news items appearing in the religious press the Rev. Donald H. Stewart who was twice refused admission to West Hanover Presbytery on account of his modernism is undertaking the pastorate of the University Church at Chapel Hill, North Carolina. This item raises several questions. Has Mr. Stewart changed the views he so emphatically re-affirmed before West Hanover Presbytery? 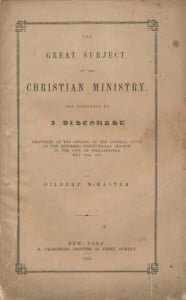 Did the Presbytery which dismissed him satisfy itself as to his doctrinal soundness; that is, did it observe the requirement of the Constitution of the Church and examine into his reported unsoundness as required in paragraph 183 of the Book of Church Order? Did the Presbytery which received him for the North Carolina work satisfy itself as to his doctrinal fitness to renew the ordination and installation vows? The reports of the former examination indicated that Mr. Stewart accepted religious experience as his rule of faith rather than the Scriptures as set forth in the first ordination vow. While the pamphlet issued and now being circulated by Dr. Wm. M. McPheeters was called forth by the actions of Arkansas Presbytery, it is a message which other presbyteries need to hear and heed. It is not too much to say that every presbytery and every presbyter ought to reconsider the solemn truth of the ordination vows before men and especially before the God of truth. Now as ever an honest man is the noblest work of God. The Book still pronounces its blessing upon the man that sweareth to his own hurt and changeth not; and still excludes those who make and love the contrary. Rev. 22:15. Standing in the shadow of eternity the eighty-year-old Southern Prophet, Dr. Wm. M. McPheeters, has issued a clarion call for a more faithful observance of the third and the ninth commandments–for truth and the keeping of vows made to the Holy God. Will the Church of today hear this word and gird herself to keep the faith before man and before God; or will she stone another prophet and leave it to the generations to come to build him a monument? The writer is not in any way a supporter of the Independent Board for Presbyterian Foreign Missions, his loyalties in this matter being to the Presbyterian Committee of Foreign Missions located in Nashville, Tenn. Nevertheless, the prosecution of the members of the Independent Board furnishes interesting food for thought and comparison to the student of Presbyterian history. The official Northern Presbyterian Board in whose interest this prosecution (or persecution) is proceeding was itself organized as an independent Presbyterian board. The General Assembly of 1831 took no action upon the eloquent plea of Dr. John Holt Rice, of Union Seminary (Va.), asking that the Presbyterian Church be recognized as a missionary society. Therefore a group of Presbyterians acting independently of the Assembly organized the Western Foreign Missionary Society with headquarters in Pittsburgh. For five years thereafter, the General Assembly continued to support the interdenominational ABCFM. The General Assembly, U.S.A. of 1925, in a judicial case, found Mr. H.P. 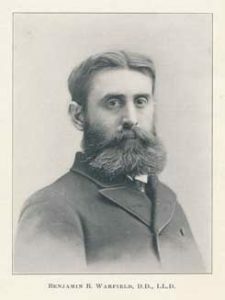 Van Dusen, now Professor Van Dusen of Union Seminary (N.Y.), guilty of holding views in diametric contradiction to the first ordination vow, namely, of refusing to accept the Virgin Birth. No ecclesiastical censure has ever been visited upon Dr. Van Dusen for this offense against the doctrine of Scripture as interpreted by the Westminster standards. The General Assembly of 1934, without judicial procedure, declared the officers of the Independent Presbyterian Board guilty of violating the fourth ordination vow. and on December the 20th, the same day as that on which the neo-pagans removed Karl Barth from his chair in Bonn, the Presbytery of New Brunswick indicted Dr. J. Gresham Machen for holding office in the Independent Board of Foreign Missions. It is a foregone conclusion that the commission of that Presbytery will declare the Westminster professor worthy of an ecclesiastical censure. The constitution defines an offense as “anything, in the doctrine, principles, or practice of a Church member, officer or judicatory, which is contrary to the Word of God or to those expositions of its teachings as to faith and practice which are contained in the Constitution of the Presbyterian Church in the United States of America.” It declares further that God alone is Lord of the conscience and has left it free from the commandments of men that are in anything contrary to or in addition to His Word. No evidence has been produced to show that Dr. Machen has been guilty of such an offense. One is reminded of a debate in the Presbytery of Carlisle on the question of the General Council. The pastor of the largest church in that Presbytery urged the adoption of the plan of a General Council in order that the Presbyterian Church might have a head. Others opposed the General Council on the ground that the Presbyterian Church already had a head, namely, the Lord Jesus Christ, and that the introduction of a second head, the General Council, would result in a hydra-headed anomaly rather than a true body. It looks like many people in the Presbyterian body are listening to the commandments of men emanating from that body which Dr. C.______ wished to see set up as “the head” of the Presbyterian Church in the U.S.A. In the eighteenth century Dr. John Witherspoon waged a vigorous fight in the Church of Scotland against liberalism in doctrine accompanied by autocracy in administration. In the nineteenth century Dr. Abraham Kuyper faced the same combination in Holland, liberalism in doctrine, autocracy in Church government. The historian of the future will write the same verdict over the current events in the Northern Presbyterian Church, unless the only true Head of the Church by the power of His Holy Spirit turn this great Church away from the heresies of the Auburn Affirmation to a Christian manifesto of faith in the miracles of the Bible and of the Apostles’ Creed. Pastor Ken McHeard is the current pastor of the Reformed Presbyterian Church (PCA) in Duanesburg, New York, engaged in a faithful ministry there, as he follows a long and eminent roster of pastors at that church. The organizing pastor of this historic church was the Rev. 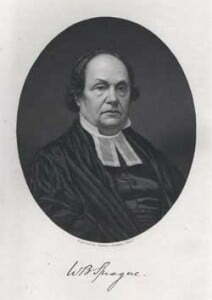 James McKinney, who served the church from 1797-1802. The second pastor and the subject of our post today, the Rev. Gilbert McMaster, served the Duanesburg congregation in a lengthy pastorate, from 1808-1840.
respectably connected, was a person of superior intellect and great force of character.” Gilbert enjoyed the advantages of a faithful Christian education and at the age of eighteen came to a public profession of his faith in Christ as his Savior. This was some five years after the family had immigrated to the United States and settled in Franklin county, Pennsylvania. Gilbert continued his education at the Franklin Academy and Jefferson College before beginning medical studies, and was admitted to the medical practice in 1805, becoming a physician in the borough of Mercer, PA. But it was not even three years, in 1807, when Dr. Alexander McLeod and Dr. Samuel B. Wylie sought him out, urging him to consider his calling to the ministry. McMaster had a high view of the ministry and shrank from thinking that he could himself be so called. But McLeod and Wylie prevailed, and as Gilbert’s studies had always included theological education, he was found ready in late October of that year to pass his examinations before the Presbytery. On August 8, 1808, he was installed as the pastor of the Reformed Presbyterian Church of Duanesburg, New York. “Dr. McMaster’s last days were spent in delightful serenity in the house of his accomplished son, the Rev. E. D. McMaster, brightened by the companionship of the wife of his youth, one of the kindest and purest of Christian women, and sustained by the respectful love of his sons, and the soothing attention of his two amiable daughters. The habitual modesty and reserve of his character continued unaltered to the last, but his long, self-sacrificing, useful and holy life was his best testimony for God. The Duty of Nations: A Sermon on a Day of Public Thanksgiving. The Embassy of Reconciliation: An Ordination Sermon. An Essay in Defence of Some Fundamental Doctrines of Christianity. An Apology for the Book of Psalms. Ministerial Work and Sufficiency: An Ordination Sermon. The Moral Character of Civil Government. The Obligations of the American Scholar to his Country and the World. 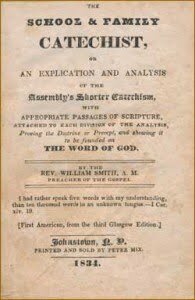 Speech in Defence of the Westminster Confession of Faith against the Charge of Erastianism.